While in Mexico last July, 2017, I had three encounters with traditional, local, Medicinal Plants experts. 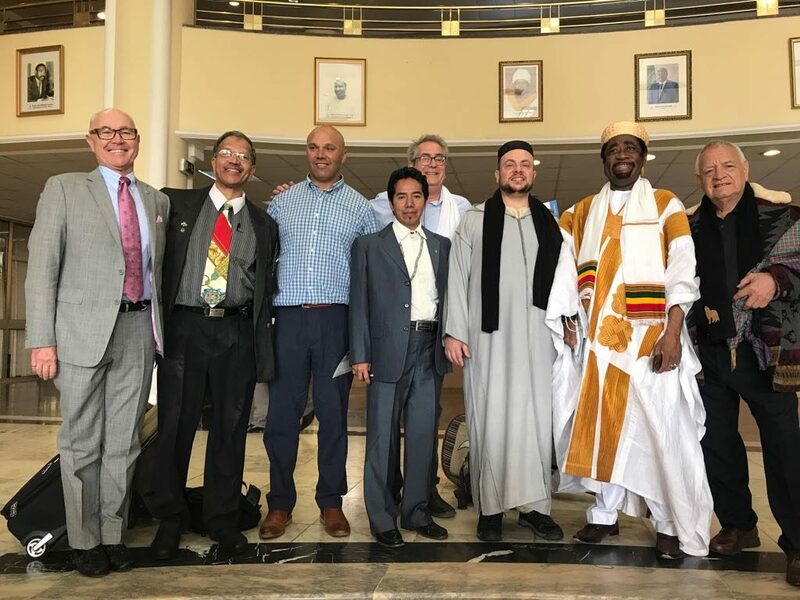 The first was in the recently created Clinic of Mazahua Traditional Medicine at the Intercultural University of Mexico State which Mindahi Bastida Munoz co-founded in 2004 in San Felipe del Progreso, Estado de Mexico. 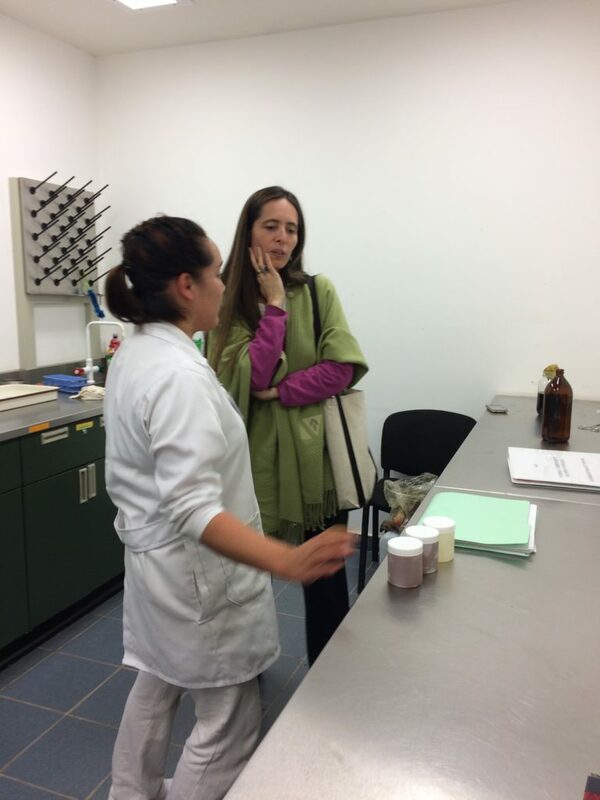 Geraldine at Phytomedicine Lab in the Mazahua Medical Center, Universidad Intercultural del Estado de Mexico. Rocio Albino, a dear ex-colleague and agro-ecologist who built the greenhouse at the Intercultural University of Mexico State as a hands-on teaching tool. 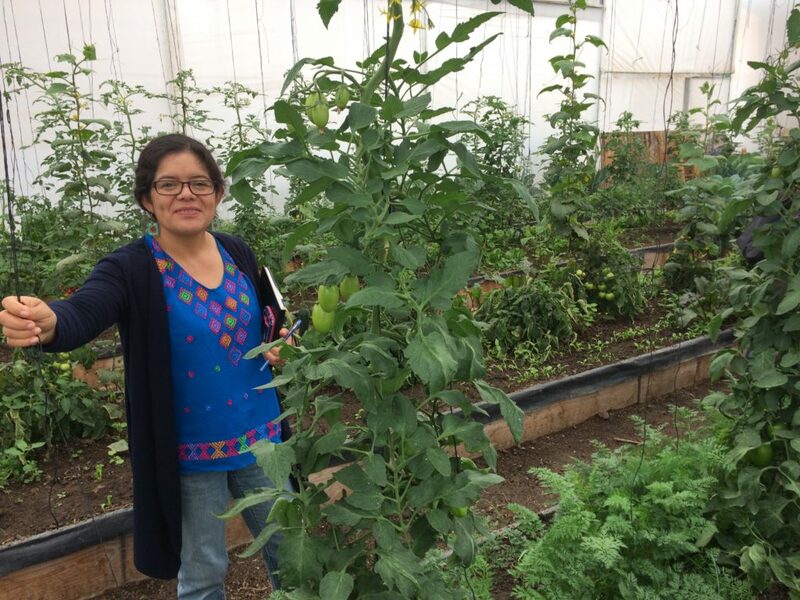 At the university there is also a greenhouse where native and non-native students, local Mazahua farmers and local agro-ecology professors grow a wide variety of native plants that are sold locally to promote organic nutrition among local native Mazahua people. 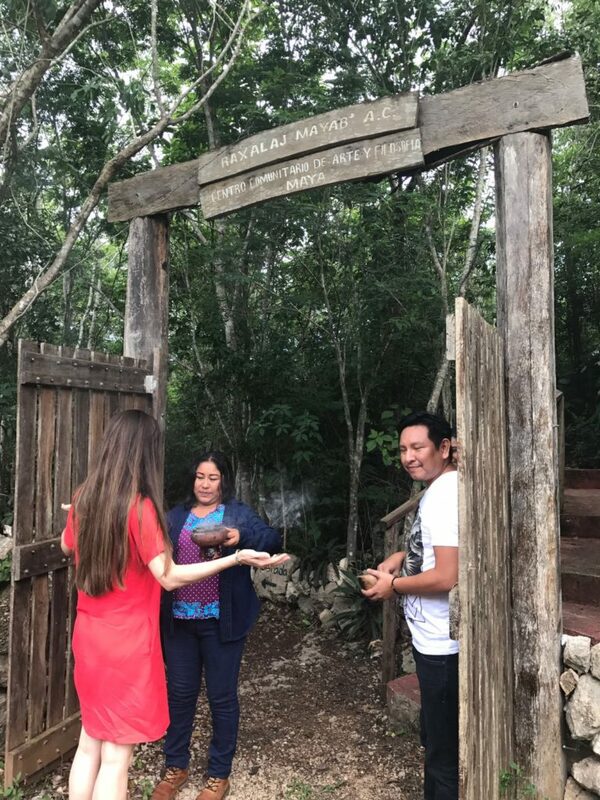 The next encounter was in Tulum, Yucatán with an expert in Mayan medicine and Chinese acupuncture, Javier Hirose, PhD. 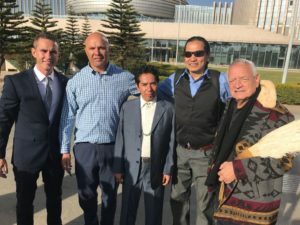 He has been able to describe the similarities between the Mayan and Chinese energy meridians and has published a great resource document about it. 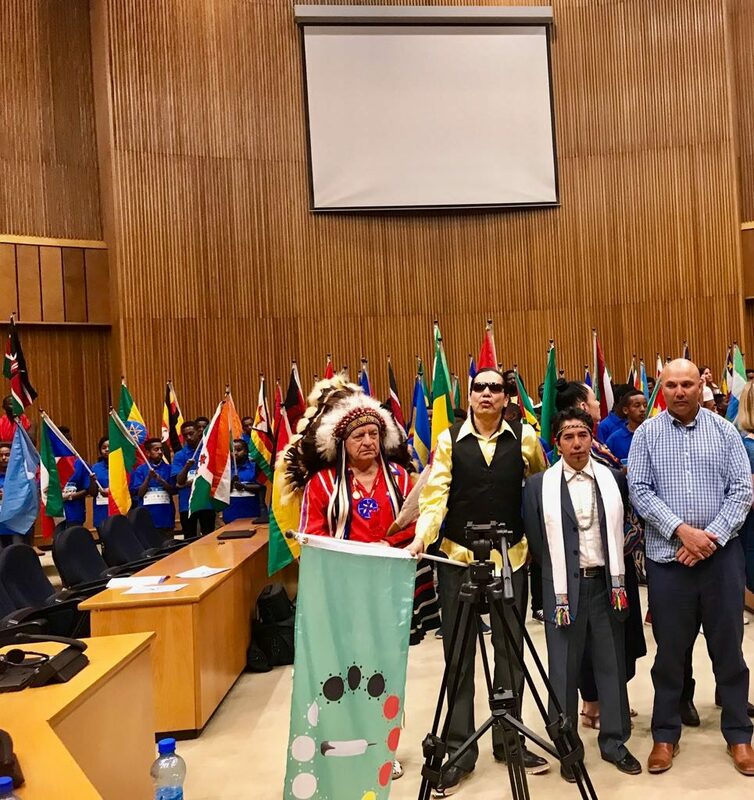 Javier Hirose and his students from across the area of Yucatan. 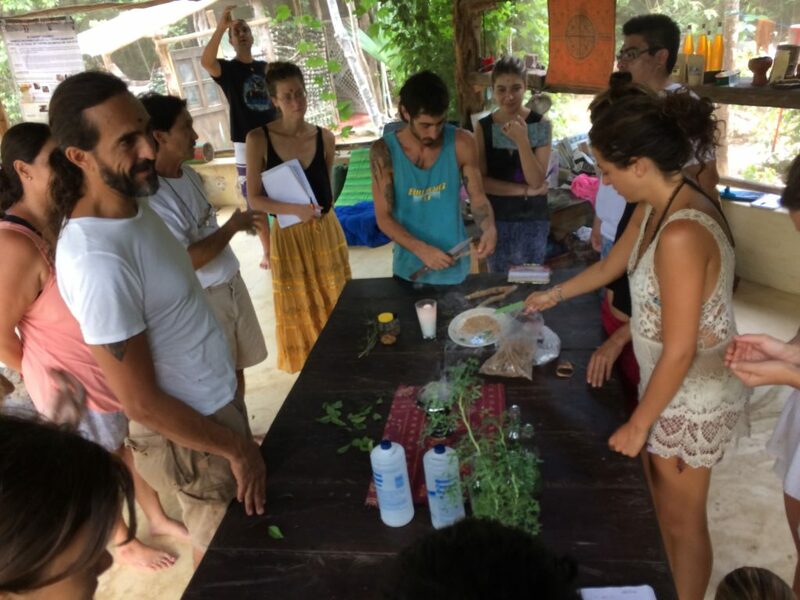 Preparing a tincture with local plants and local residents. 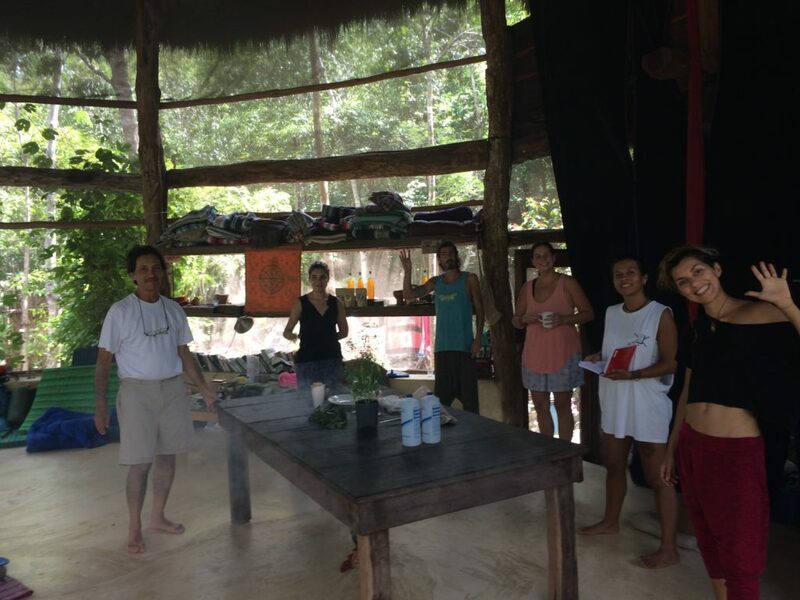 Finally, I was able to share with a community of young Mayan researchers who are also making plant medicine according to their elder’s guidance. Their center is called Raxalaj Mayan AC and they are very interested in my research on the Mayan Calendar. 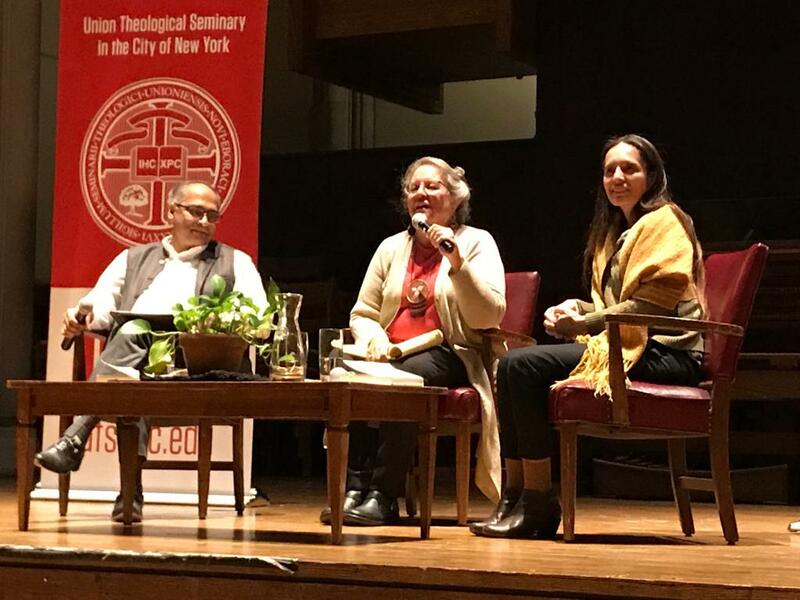 We held a very enriching conversation about how they are exploring ways to recover traditional philosophy and wisdom, and how to share it with younger generations. It was deeply moving! Thanks to Angel and the rest of the group! Entrance to the Community Center of Mayan Art and Wisdom. 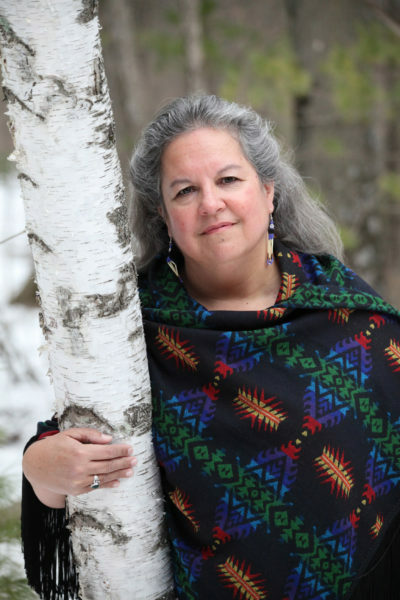 As you may know, our Herbalist in Residence and dear colleague Poppy Jones is beginning to offer a series of workshops about plant medicine to Union students. It is such an opportunity for us to connect with Earth and with the principles of healing and harmonizing that she unconditionally offers. It is a kind of connection that is spiritual and reciprocal in ways that can fully be comprehended when having an immersive experience. Walking with Poppy in the woods is one way of entering that space of our psyche where the heart becomes our ears and eyes, and words need not be spoken to communicate what plants are telling. In the wake of Mayan civilization some 5,000 years ago, corn and humans became one. Till today, humankind’s flesh is believed to made from corn dough. The intimate corn-human relation is kept alive by reflecting how death and birth cycles are interwoven. When the corn seed is in-terred, it is as though a dead human is buried. When, at the closing of the season, corn cobs are fully ripe, it is as if the dead person surfaces to join the living. An antagonist corn-human metaphor in Mayan philosophy entails alive impersonators instead of dead impersonators. It speaks of how a human seed travels into the womb so to emerge as a baby, and how a corn seed enters the earth so to become a baby, too. Human and corn seeds go through a 260-day full-being formation cycle. For both, the 260-day cycle is lead by Venus, a time-councilor for mothers who are home-and-cornfield caretakers. Be it as morning star or evening star, when Venus’s first appearance coincides with February 12th “blessing of the seeds” -seeds soon to be buried- and with the “announcement of human pregnancy” -no menstrual blood-, something striking happens. The star accompanies the gestation cycle of both the human baby and the corn baby. Both will ripen and be ready by November 1st. Only then, Venus star shall sink in the horizon, for its infusion of vital energy is now completed. 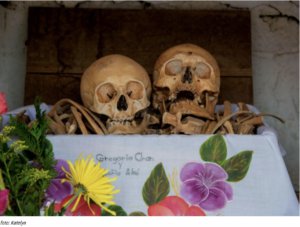 For Mayan people of Pomuch, Campeche, tradition says that skulls of their dead relatives must be pulled out of the boxes and cleaned with much reverence and respect -like the rest of the bones. Once clean, family members offer their dead special food and drink, including toys if children and liquor and tobacco if adults. Eight days later another offering is made and, towards the end of November, there is a special farewell. Skulls in Homuch, Campeche, are brought among the living in month Tzek (Skull). Photo by Katelyn published by Julio Garcia Castillo. Why Did Two Cultures Pick November For Their Dead? 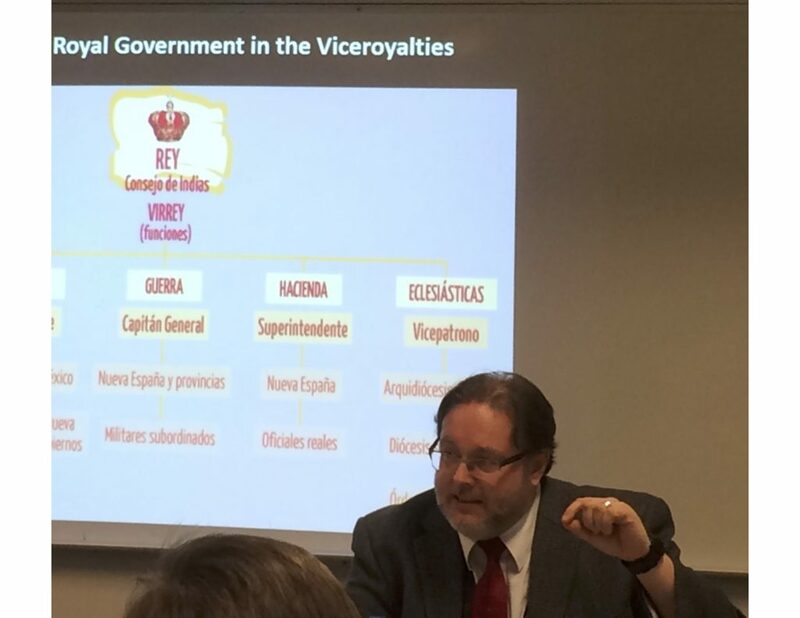 Currently my colleagues from Universidad de Oriente are visiting places and promoting intergenerational conversations. They intend to better understand how the original twenty-day ‘month’ of Tzec was juxtaposed by the Christian month of November. Surely, there are reasons of cultural survival: not using Christian references cost Mayan priests their lives. But it is fascinating to see how a culture as old as the Mayan picked November 1st some 2,600 years ago, while All Saints celebration (also on November 1st) was incepted by Gregory IV in middle of the ninth century. Is there some natural phenomenon at that instant of time that facilitates communication between the dead and the alive? Perhaps yes, but clearly, agricultural cycles must be playing a role in how human minds conceive the interring of a seed as an act of bringing to life fully-grown fruits. 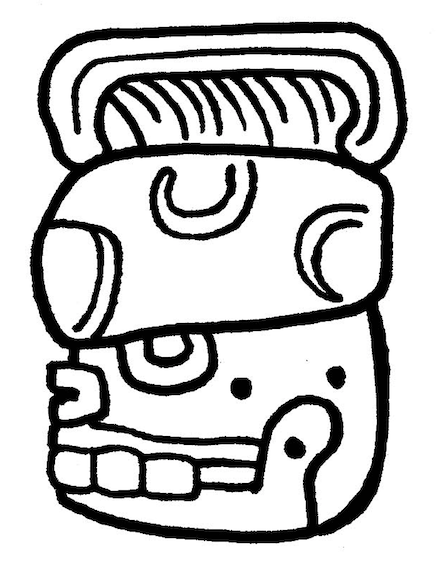 Both Western and Mesoamerican are agricultural societies on the same hemisphere. Surely, November is a good month to reflect about how the hoop of death and life is closed.